Kim Johnson takes us on an unlikely path into music. In his talk he explores the subtleties of the one of the worlds most motivating and inspiring movements. His insights challenge our common conceptions of musical practice and its performance. An enormous poster of the movie “Casablanca” looms over a desk as film producers Kim Johnson and Jean Michel Gilbert speak, via Skype, from Port of Spain in Trinidad and Tobago. The poster does not suggest any particular passion for Humphrey Bogart. Rather, it is a sly reference to the history of the steel pan, also known as the steel drum, the instrument invented on the island of Trinidad, and the subject of a 2014 film produced by Gilbert and Johnson. According to them, the steel pan bands of the 1940s and 1950s took their names from popular movies of the day. “Casablanca was one of the greatest early bands,” says Johnson, a native Trinidadian and a leading scholar of the history of steel pan music. That music is the subject of “PAN! Our Music Odyssey,” a docudrama they produced with Barthélémy Fougea. The film will screen June 14 at the AFI Silver Theatre as part of the 2015 DC Caribbean FilmFest, running June 12-14. Directed by Jérôme Guiot and Thierry Teston, it’s no cookie-cutter documentary. “It’s a very peculiar hybrid movie,” Johnson admits, referring to the film’s blend of historical fiction, talking-head interviews and reality-TV-style chronicling of a contemporary steel band contest. 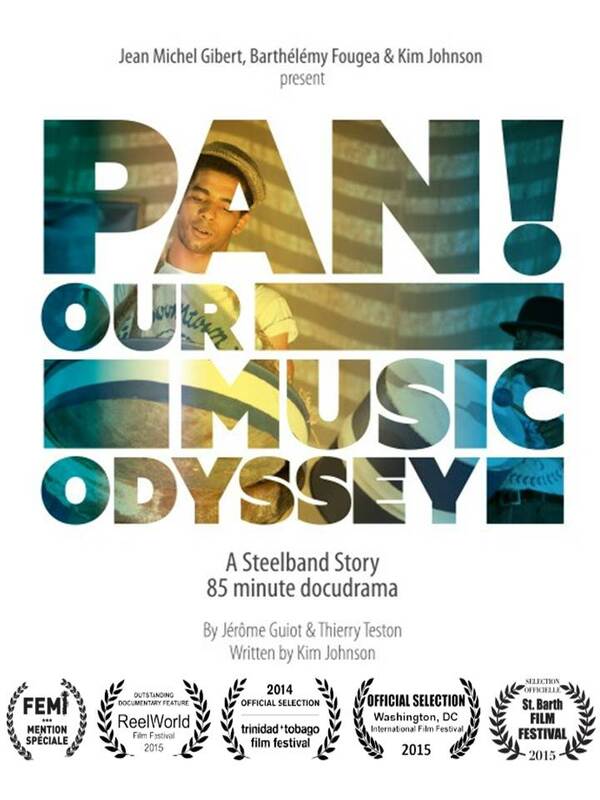 The fictional narrative evokes the history and prehistory of steel pan, focusing particularly on the period during and after World War II, when Trinidadians began creating percussion instruments from the metal drums that were used to store oil and other liquids on U.S. military bases. New York Closes Caribbean-American Heritage Month at the Brooklyn Museum with PAN! The Brooklyn Museum is hosting the CaribBEING’s Heritage Film Series produced by Shelley Worrell as part of New York’s observation of Caribbean Heritage Month. On closing night, on Sunday, June 28 2015, the critically claimed musical documentary, PAN! Our Music Odyssey will make its grand premiere, at 2 pm. This poignant film which I first wrote about when it was still in production, had captivated me before I even saw it. Now, I am so pleased to say, it has been sweeping film festivals around the world and gaining the favorable attention of critics and audiences alike with its inspirational true story of revolutionary artistic genius birthed in poverty and revolt against the system. Fittingly enough, the Brooklyn Museum is also exhibiting the artwork of the punk, hip hop, graffiti poet Jean-Michel Basquiat and I cannot imagine any better ambiance for PAN!’s premiere than the backdrop of his artistic genius which was also birthed in poverty and revolt against the system. Pan! Our Music Odyssey Movietowne Theatrical Release EXTENDED! The groundbreaking locally produced film Pan! Our Music Odyssey has been held over for another week at MovieTowne Port of Spain because of the enthusiastic response from the public. “Excellent,” “brilliant,” “brought tears to my eyes,” “made me proud as a Trini,” “should be in all schools,” were some of the comments heard at screenings at which the audience burst into applause. 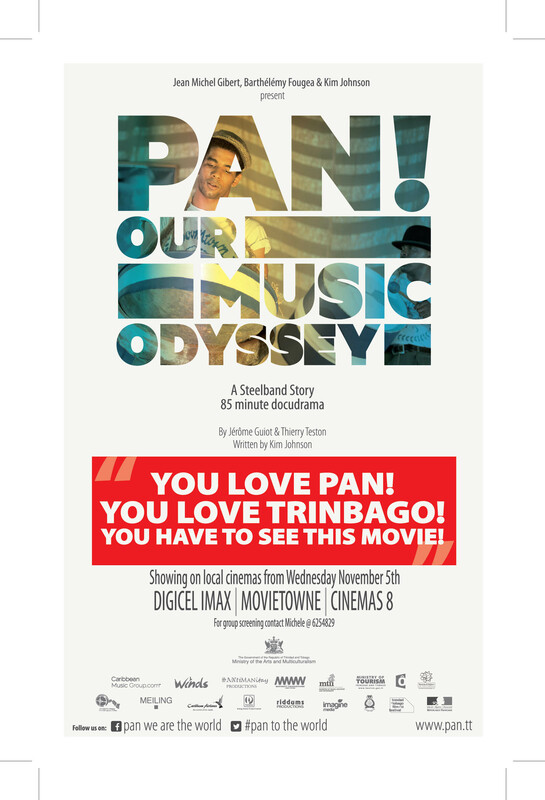 From November 12 to 18, local movie goers can catch two daily screenings of the film at Movie Towne Port of Spain at 12.40 p.m. and 2.45 p.m.
PAN! Documentary Movie in Trinbago Cinemas for One Week Only! We’re just a few short days away from Pan! Our Music Odyssey’s national opening at Movie Towne, Cinemas 8, Empire Cinema and Digicel IMAX. Pan! Our Music Odyssey opens at cinemas across the country on November 5th. The film can be seen at Cinemas 8 Trincity, Movie Towne, Digicel IMAX and Empire Cinema San Fernando. The site is about the latest news on pan from a team based in Trinidad and Tobago. It is about looking to build communities with all steelband practitioners of the world through our Trinbago steelband directory and our world steelband directory. It is about creating network and potential opportunities for steelband and pan practitioners all over the world. Please share it with your friends, family and all pan fanatics of the world! Click here to find out more about the project.